Thieves have targeted a historically important submarine wreck lying in the English Channel, it has emerged. English Heritage said divers stole the torpedo tube hatch of the Holland 5, which sank six miles off Eastbourne in East Sussex in 1912. The theft was discovered during a licensed dive by the Nautical Archaeology Society (NAS) in June and confirmed during a dive last month. The NAS described the wreck as a "remarkable piece of naval heritage". Sussex Police and English Heritage have appealed for help to catch the perpetrators, who may have struck up to two years ago. Experts said a group of people would have been behind the theft but that the hatch carried very little monetary value. Police said removing the hatch and accessing the site without a licence was illegal under the Protection of Wrecks Act 1973. The Holland class of submarines were the first submarines to enter service in the British Navy following extensive trials, English Heritage said. 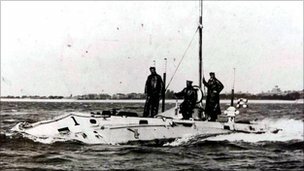 The class of submarine became obsolete in the early 20th Century and in 1912 the Holland 5 was destined for scrap.